Moscow court extends probation period for Navalny | Russian Legal Information Agency (RAPSI). 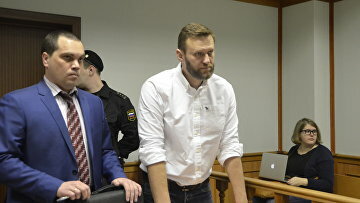 MOSCOW, August 4 (RAPSI) - The Simonovsky District Court of Moscow has extended probation term of opposition politician Alexey Navalny for another year in the Yves Rocher embezzlement case, RAPSI correspondent reports from the courtroom on Friday. The court granted a request of the Federal Penitentiary Service noting that Navalny repeatedly violated administrative legislation during his probation term. In particular, a representative of the Service noted that Navalny failed to meet his obligation to be registered at a local penitentiary inspection office on time. Navalny himself argued against the extension, saying that previously courts dismissed similar motions. According to Navalny, the Service’s request seeks to obstruct his participation in elections. 17:55 04/08/2017 The Simonovsky District Court of Moscow has extended probation term of opposition politician Alexey Navalny for another year in the Yves Rocher embezzlement case.